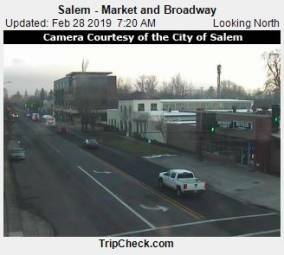 It's 22:07 in Salem, USA right now. Salem - Market and Broadway A view of the current traffic situation on the Salem. Albany, Oregon: Weathercam Albany, 21.5 miles away. Valley Junction, Oregon: ORE18 at ORE22 - Valley Junction, 27.5 miles away. Yamhill, Oregon: NW Meadow Lake Road, 28.5 miles away. Colton, Oregon: Sasquatch Station 626, 33.2 miles away. West Linn, Oregon: Trillium Creek Primary School, 34.8 miles away. West Linn, Oregon: Lowrie Primary School, 34.8 miles away. Gladstone, Oregon: I-205 at Gladstone, 37.7 miles away. Beaverton, Oregon: ORE217 at Allen, 39.9 miles away.